“During a few networking meetings I began to think our leaflets were looking tired and we were running low” says Jackie Sharp Director at Co Prom. “I bounced a few ideas off Sandie and Simon at the Brand & Design Agency Seventy Miles South in Portsmouth and after a few brainstorming sessions they produced these stunning leaflets at a very reasonable price, within a month.” Says Sharp. Co Prom are not the same as business gift catalogue companies who stock a limited range of items, onto which a logo is printed. Co Prom “source” items directly from manufacturers worldwide, delivering a hugely diverse range of items for an equally diverse range of clients since 1984. “We think this will help people understand what we do in a novel but professional way.” Says Sharp. See for yourself. 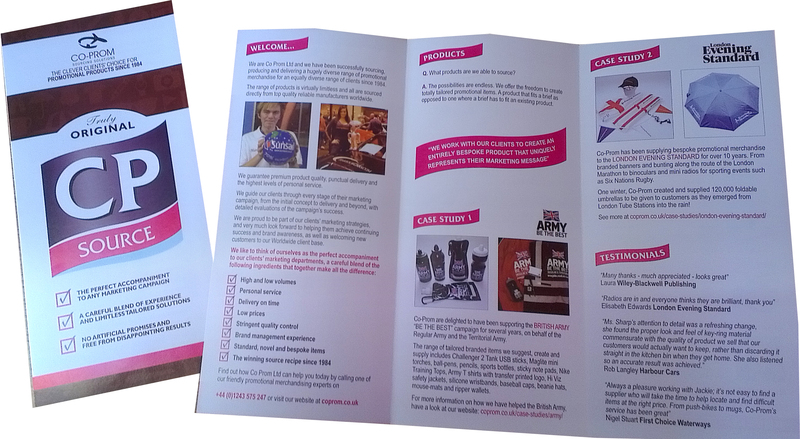 Call or email for your FREE leaflet today.